Xiaolin Lu, an expert in the Internet of Things, will be the keynote speaker at the 2017 RIT ARM Developer Day event on Friday, Jan. 27. RIT ARM Developer Day is open to engineering, engineering technology, computing and science students from RIT and regional colleges and universities. Programming consists of demonstrations, exhibits and hands-on workshops for students and faculty by companies that manufacture, distribute and support ARM-based products, covering a variety of development platforms, environments and tools. ARM Ltd. designs and licenses ARM (advanced RISC machines) microprocessor architectures. Registration is free and can be accessed online. Check-in begins at 9 a.m. and concurrent workshops begin at 10:30 a.m. in RIT’s Kate Gleason College of Engineering. Afternoon workshops resume at 1:30 p.m. to 4:30 p.m. A full list of the workshops can be found online. The previous year’s event had 328 students and faculty from RIT, the University of Rochester and Monroe Community College registered. Similar registrations are expected this year, said Roy Melton, a faculty member in the computer engineering department of RIT’s Kate Gleason College of Engineering. 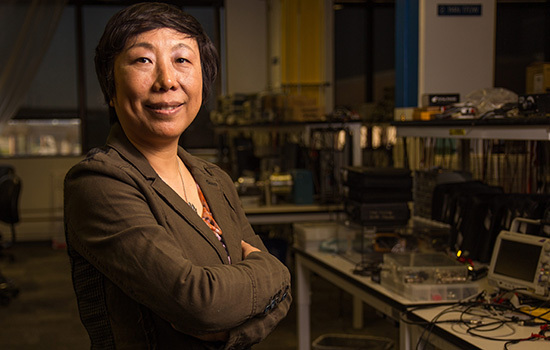 Xiaolin Lu is recognized for her breakthrough work on embedded systems for the industrial internet, smart grids and ultra-low-power communications systems. As a Texas Instruments Fellow and research and development manager, she leads the company’s Kilby Innovation Technology Center in Dallas. Along with research initiatives and product development, she has received numerous awards for her diversity efforts from organizations such as the Society of Women Engineers and the National Women of Color organization. ARM Developer Day is sponsored by RIT’s computer engineering, microelectronic and electrical engineering departments and the ARM University Program. For more information about the event, contact RIT_ARM_Day_2017@mail.rit.edu.